Dreamfoam Bedding recently took over the top sales spot for a mattress on Amazon.com. Read more to find out how a small American manufacturer managed to topple its competition. A small, family-owned business earned its stars today in one of the world’s toughest marketplaces. 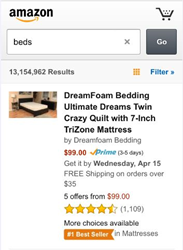 As of April 13th 2015, Dreamfoam Bedding, a Phoenix-based bedding manufacturer, was listed as having the number one selling mattress on Amazon.com. “There are thousands of beds for sale on Amazon, “said John Merwin, owner of DreamFoam Bedding. “To have the bestselling mattress is really an honor.” The DreamFoam Crazy Quilt 7” foam mattress surpassed all its competitors. It has a Tri-Zone core to give each part of the sleeper’s body the support it needs, which has clearly been well received by the American public. "This is just a great mattress and it’s sold at such bargain,” Merwin continued. “The Tri-Zone core means more support for the heavier parts of your body giving you proper spinal alignment and a restful night’s sleep.” The bed is available on Amazon where over 1,000 buyers have reviewed the bed and given it an overall ranking of 4.5 stars. Over 770 consumers have given it a full 5-star rating. "This sales honor validates our goal to create a comfortable, supportive mattress that can be sold at a very affordable price. When you have over a thousand customers telling you that you've succeeded, it is really remarkable and rewarding,” Merwin concluded. To see the full line of DreamFoam latex and memory foam mattresses, go to Amazon.com and search DreamFoam.